The recently released iPhone wins great popularity in the Apple's Fall Event as it has surpassed many portable devices in regard of entertaining functions. But as we all know that, not every video files can be played on iPhone, such as the widely used AVI, WMV files playback on Windows media player, FLV video downloaded from video sharing sites, like YouTube, 3GP videos for mobile phone, etc. All of them are not compatible with iPhone. 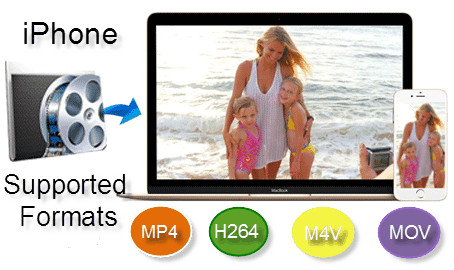 H.264 video up to 4K, 30 frames per second, High Profile level 4.2 with AAC-LC audio up to 160 Kbps, 48kHz, stereo audio in .m4v, .mp4, and .mov formats. AAC (8 to 320 Kbps), Protected AAC (from iTunes Store), HE-AAC, MP3 (8 to 320 Kbps), MP3 VBR, Audible (formats 2, 3, 4, Audible Enhanced Audio, AAX, and AAX+), Apple Lossless, AIFF, and WAV. Have you ever got some videos like AVI, MKV, MTS, FLV, WMV or H265 (HEVC) but are not in the iPhone supported video/audio formats list? Want to play videos on iPhone without format incompatibility issue? Take it easy, just free download an iPhone video converter to tackle the video conversion for your iPhone model. MacX Video Converter Free - Play any video on iPhone like a Ninja! 1). 1-click to Free convert MKV AVI HEVC WMV to iPhone at 83X faster speed. 2). High Quality Engine to keep output file with 98% quality reserved! 3). Free convert 4k to 1080p, MKV to MP4, AVI to iPhone, HEVC to H264, etc. 4). Transfer any video to iPhone iPad, iMovie, iTunes, Apple TV, etc. Then how can you enjoy DVD movies or video files that are not in MP4, H.264, MPEG-4 format on iPhone? Digiarty Software provides free solutions to users to rip both homemade and protected DVDs, convert HD, UHD & SD video files to iPhone supported video and audio formats. 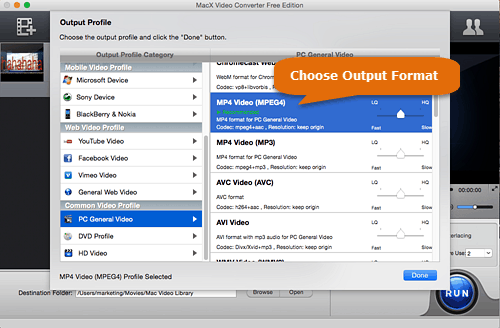 MacX Video Converter Free (for Windows/Mac): All-in-one free video converter for you to convert Ultra HD, HD and SD video, including 4K UHD, 1080p, HEVC (H265), MKV, AVCHD, M2TS, AVI, FLV, WMV, 3GP, etc to iPhone XS/XS Max/XR/8/7/SE/6S/6/5S/5C, iPad Pro, iPad Air, iPad Mini, iPod, MP4, MOV, iTunes videos and more. 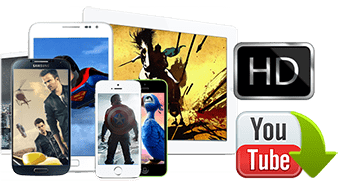 Free download this top free video converter software right now to enjoy favorite videos on your iPhone. 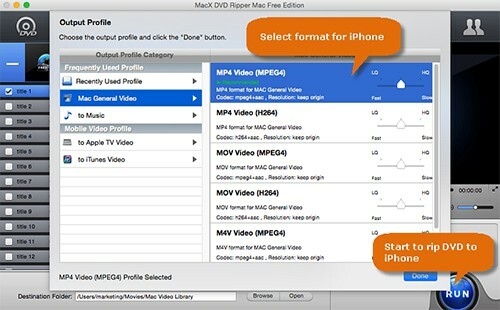 MacX DVD Ripper Free (for Windows/Mac): Ultimate free DVD ripper for you to rip any DVDs to MP4, MOV, MPEG, FLV, iTunes videos and MP3 audio formats that playback on Mac, iPhone, iPod, iPad, QuickTime, etc., no matter your DVD disc is 99-title protected, partly damaged, unplayable DVD, workout DVD disc or AV adult DVD. You can free download this free DVD ripper for Windows/Mac to watch DVD movies on your iPhone with original quality. Free download the best free video converter to decode and encode video, free convert video from H265 to H264, as well as MKV to MP4, AVI to MP4, AVCHD to iPhone, YouTube to MP3, etc. Also a good video editor and video compressor to free trim/crop/rotate video, add subtitles to video, adjust video resolution, frame rate, bitrate, aspect ratio, etc. to balance quality and file size. 1-click to bulk transfer videos from iPhone to Mac.